In 1969, the owners began their annual summer pilgrimage from Dallas to Maine, looking for respite from their busy lives and seeking the tranquility of the east coast. On one of their trips, they asked a realtor to find a property with crashing surf; they saw a picture of this artistically geometric home and purchased it upon first sight. 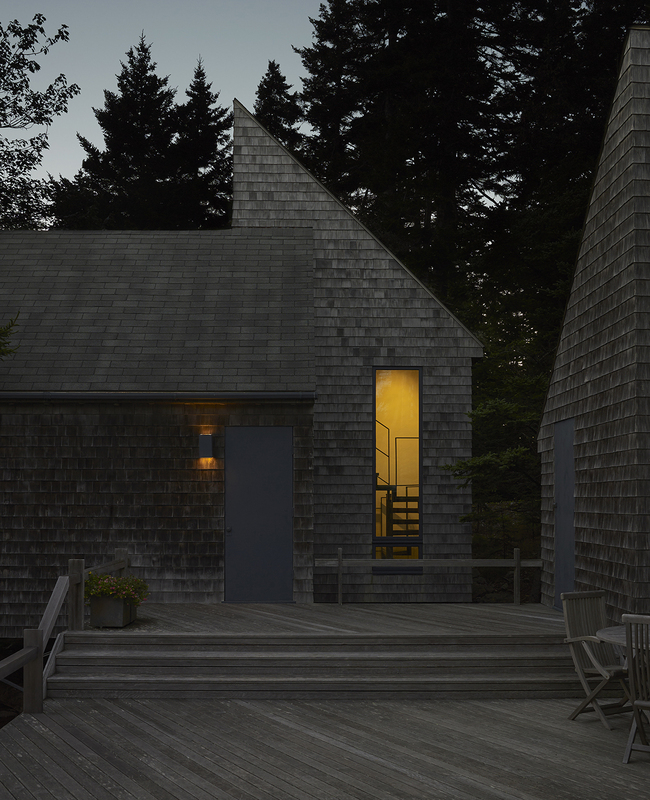 Originally built in 1976, it was inspired by the Heckscher House on Deer Isle, Maine, designed by modernist architect Edward Larrabee Barnes. As previous clients, the new owners sought Knickerbocker’s help in revitalizing the structures to fit their needs. Despite being perpetually attracted to the English Tudor aesthetic, the owners dove head first into this new chapter of their lives, one filled with the sharp angles and bright colors of Mid-Century design. The main house is characterized by strong lines juxtaposed with sweeping curves, all the elements highlighted by entire walls of windows looking out to the sea. The focal point of the main house is its spiral staircase, which holds a commanding presence in the center of the structure. Composed of plaster and reclaimed wood, it complements the hard angles present in the surrounding spaces. The owners were insistent on maintaining the integrity of the original design, which was set up on a grid system and carefully placed within the landscape; in turn, only slight changes were made. New hardwood floors served to brighten the space and mirror the tones of the plaster. The kitchen received the most dramatic update in the main house. The cabinets, appliances, and counters were replaced, including the addition of a new owner-designed island. 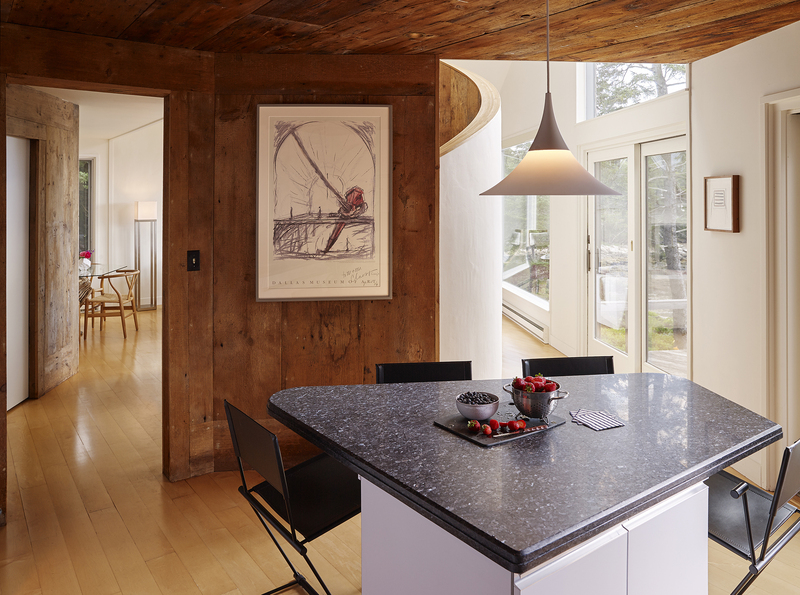 The island not only created another surface, but increased storage as well; the design echoing the geometric forms found throughout the other rooms. The wood covering the walls and ceiling of the kitchen is reclaimed barn board, original to the house. The delicate curve of the central pendant serves to perfectly mirror that of the sweeping stairwell beyond. Light floods in from the living room, and adjacent doors provide direct access to the unifying deck and ocean views. The dining room of the main house is an extension of the living room, flowing into its own angled nook. The Mid-Century aesthetic is fully realized in this space; Wegner chairs flank a custom dining room table. The base of the table, constructed from driftwood the owners found washed upon their rocks, had to be baked and treated; they then worked closely with local Portland artist, Brian Lazarus, to create the table and glass top design. This piece perfectly portrays the connection and contradiction between the modern and sleek interior of the house and its surrounding rustic, untouched landscape. 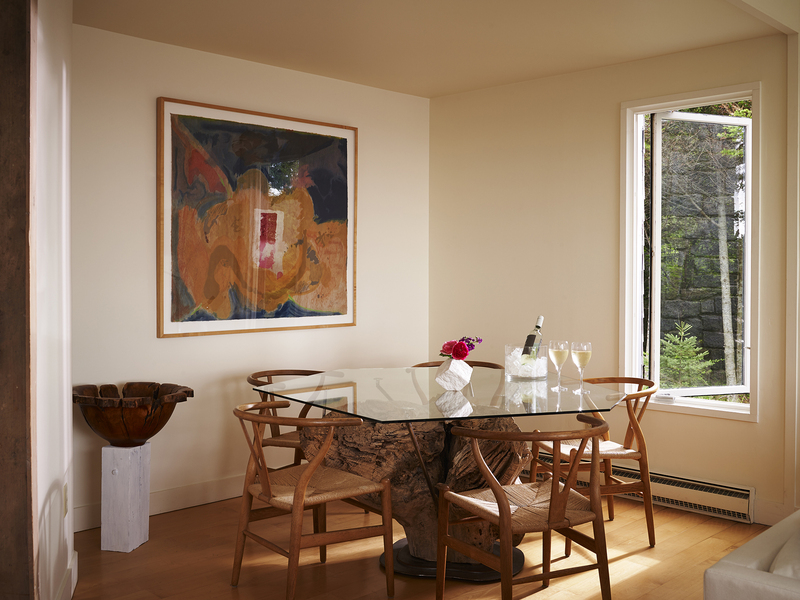 The room is further accentuated by a large abstract expressionist woodcut, the work of artist Helen Frankenthaler. Years after the success of the main house renovation, the owners were eager to begin the next phase of the project; this involved building an addition onto the existing studio, which sits adjacent to the house. The original studio was nothing more than a large living room with a lofted space connected by a ladder. 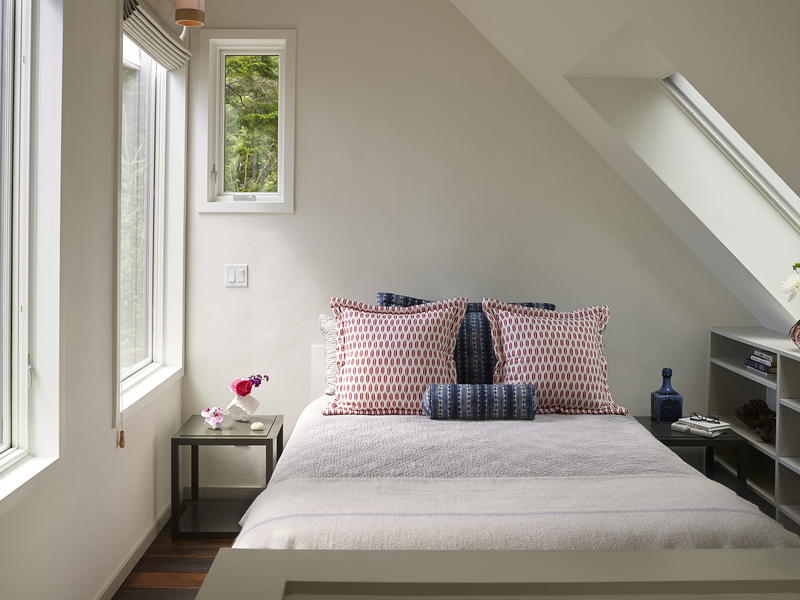 The renovation added a first floor bathroom, spiral staircase, and sleeping quarters on the second floor, with each new element following the strict geometry that was so important to Barnes. 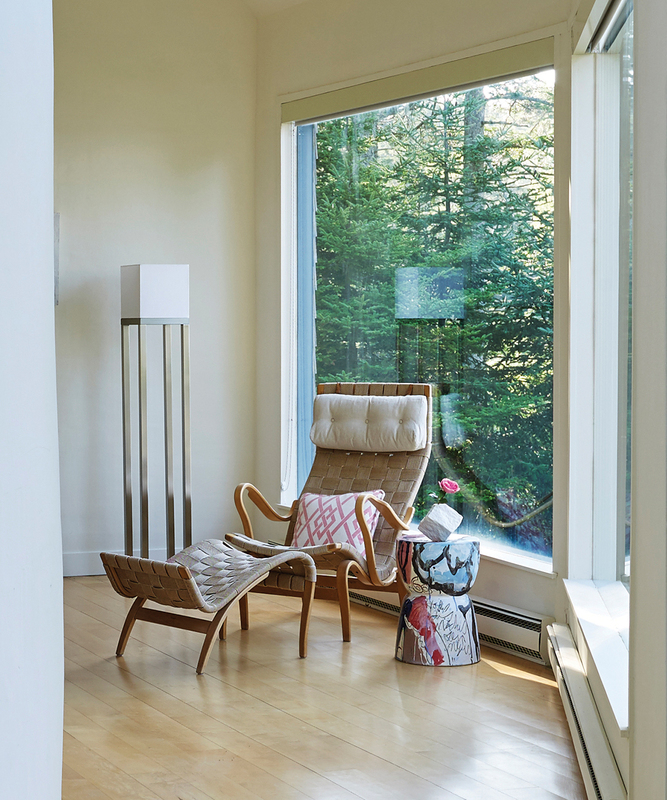 Upon entering the inconspicuous door to the studio, the airy great room is highlighted by a floor to ceiling window. Originally, the window had a Roman arch at the top; it was reconfigured to better reflect the angles of the roofline. 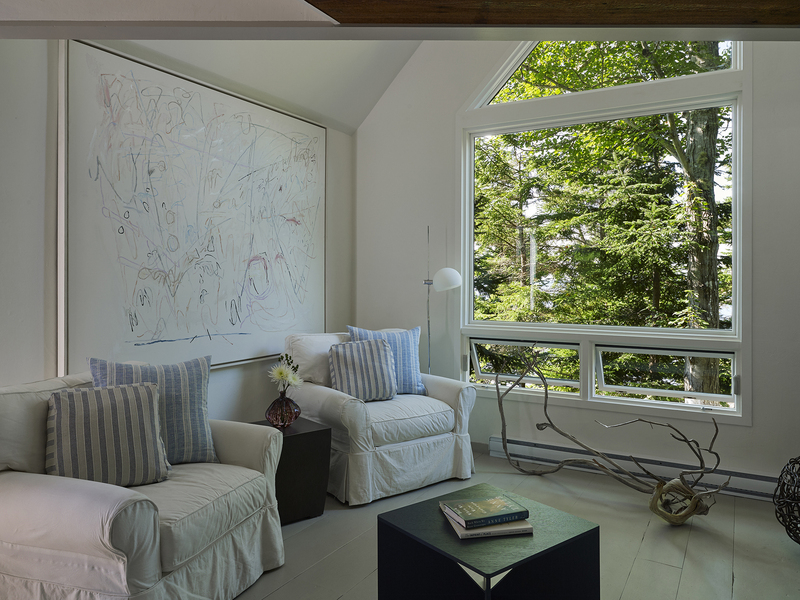 The owners found the sweeping driftwood branch on the beach and selected a large-scale abstract artwork to grace the wall, a piece by Nancy Graves. 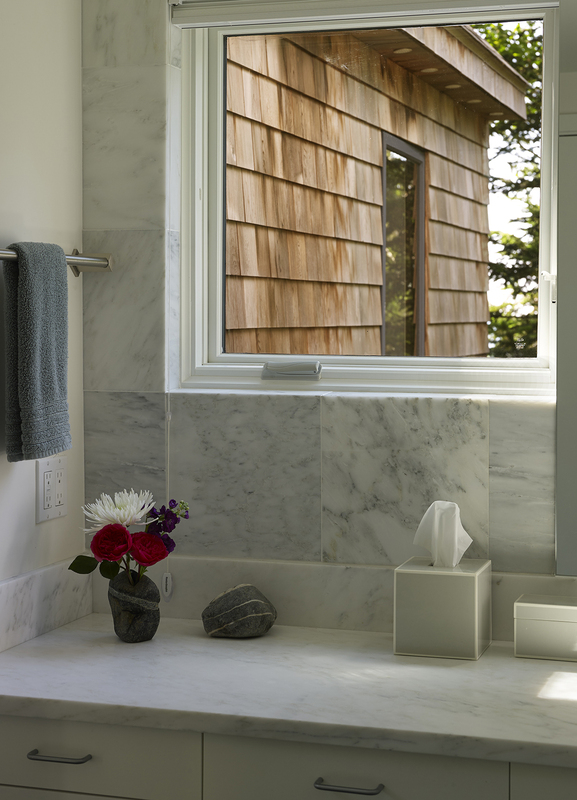 Throughout the window redesign process, each shingle was meticulously removed from the exterior wall. They were carefully numbered, and placed back in their exact same location…an example of the attention to detail and respect for the original structure that drove the entire project. 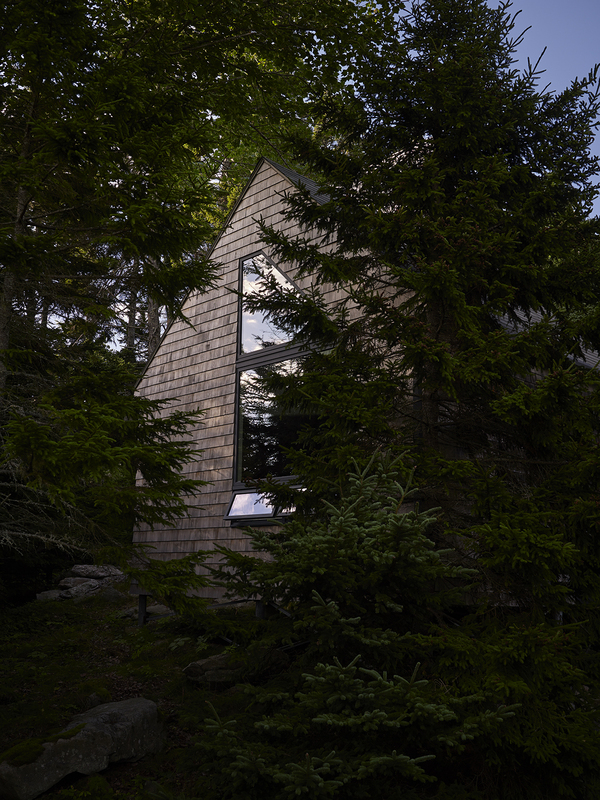 The studio window offers filtered views through the trees to the water and rocky ledge down below. Just off the great room, the new addition includes a two floor mezzanine space with a full bath on the first floor. 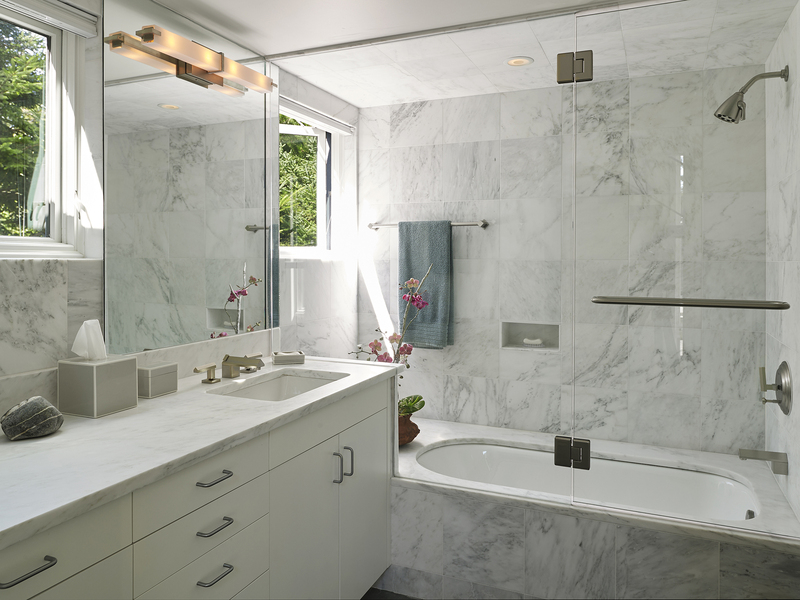 The Carrera marble covered bathroom continues the bright and airy feel. Clean, minimalistic accents reiterate the modern aesthetic. The spiral staircase is the pivotal design element in the studio. Beginning with a minimalist concept, the collaboration with Mike Tomacelli of Midcoast Machine brought the idea to life. The open structure is erected solely of steel and slate. 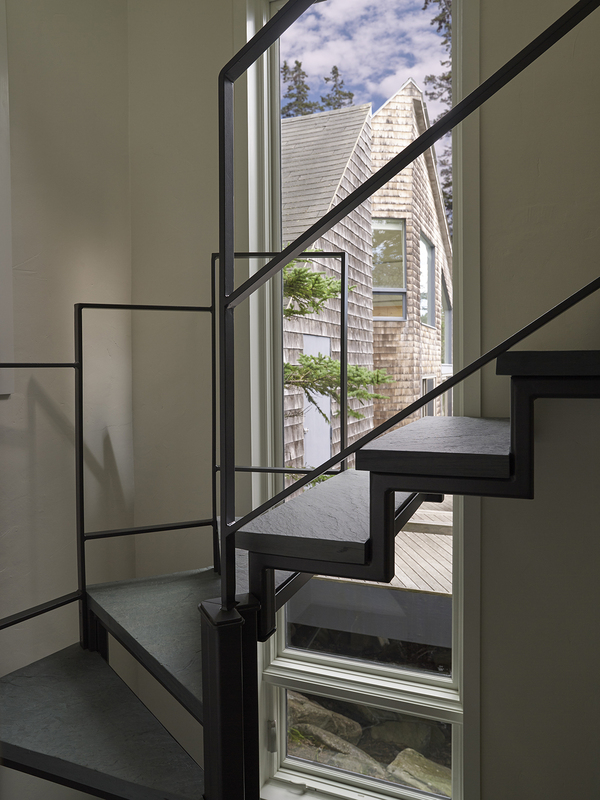 As with many features throughout the compound, the spare simplicity of the stair contradicts the engineering complexity involved. 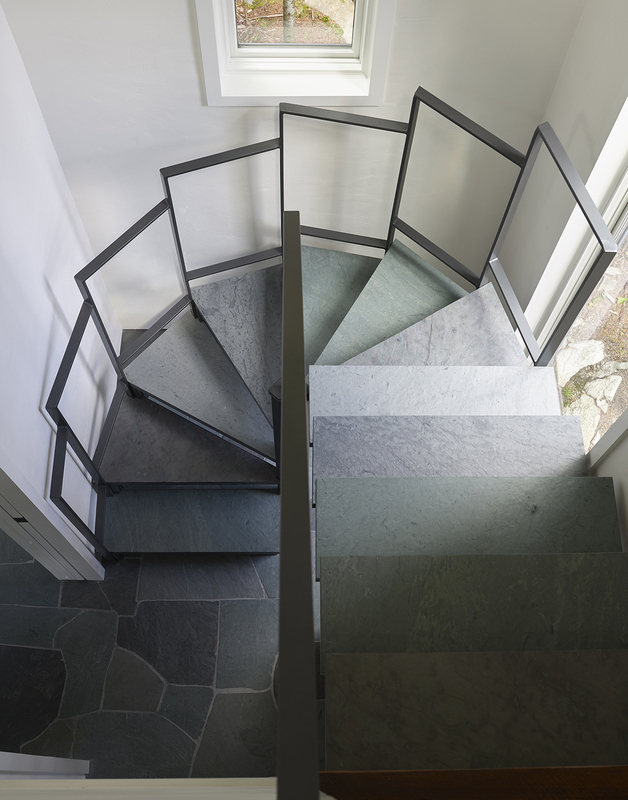 Each step of slate was hand selected and cut to fit its unique location, creating a beautiful gradation of color that seems to move with the stair’s curvature. 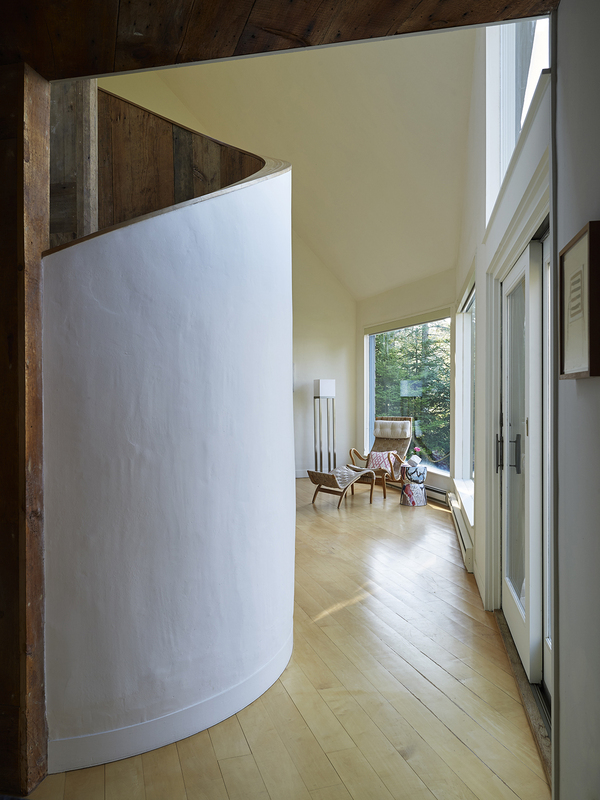 A tall, narrow window at the base of the spiral staircase offers a long, linear view along the deck to the main house, its steeply gabled forms in the same proportion as the surrounding stairwell. At night, interior lighting casts a warm glow on the painted surfaces, sharply contrasting the structural forms and showcasing the stairs as yet another work of art in this creative complex.